On the banks of the Colorado River. 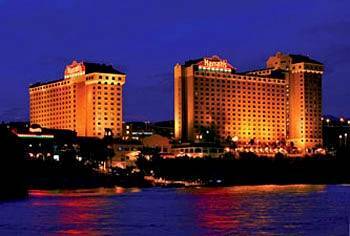 Harrah's Laughlin Casino features 55,000 sq. ft. of festive Southwestern atmosphere and Nevada-style casino gambling 24 hours a day. With more than 900 slots, you're sure to find a game that's just your style of fun! It's all here, from the newest and hottest video reels to the classic spinners and progressives that tempt with life-changing jackpots. All the classic table games are here, and a few you might not expect! So pick up the dice, pick your numbers or pick whether to hit, stand or double down- the choice is always yours when you Come Out and Play your favorite table games at Harrah's Laughlin Casino. The Keno lounge has games such as Fast Ball Keno, Viva Keno and the new statewide progressive game, MegaKeno. The horses and all your favorite games - this is action just your style and the Race & Sports Book at Harrah's Laughlin is the place for great Laughlin sports betting. The Range Steakhouse - Upscale Steakhouse - When you dine at The Range, any meal becomes a special occasion, with a classic steakhouse menu and views of the Colorado River. Fresh Market Square Buffet - The Fresh Market Square Buffet offers Laughlin's greatest spread, with over 100 items daily. Beach Cafe - Casual Cafe/Variety - For breakfast, lunch and dinner you'll find mouth-watering favorites. Baja Blue Restaurant & Cantina - Casual Mexican/Southwestern - Baja Blue offers new twists on south-of-the-border favorites, and classic cocktails like margaritas. Starbucks Coffee - Quick Bites Cafe/Variety - Fuel up or refuel with your favorite classic Starbucks beverage. McDonald's - Quick Bites Cafe/Variety - Egg McMuffins, Big Macs, Chicken McNuggets and those world-famous fries are waiting! Cinnabon - Quick Bites Cafe/Variety - The aroma of Cinnabon tempts you to indulge with a flavorful cinnamon roll and a cup of Seattle's Best Coffee. Dreyer's Ice Cream - Quick Bites Dessert - There is nothing better than a scoop of delicious ice cream to top off a perfect evening at Harrah's Laughlin. Whether you're looking to unwind at the spa or the great outdoors, Harrah's Laughlin offers something for everyone. Choose from one of the many services at the spa or spend the day at the beach. Cool off from the heat at the resort's refreshing pool or enjoy watersports at the nearby Colorado River. Golf packages are also available.